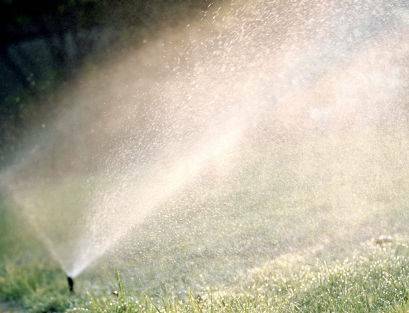 Your lawn sprinkler system brings many years of service and saves you hours of labor. It waters your lawn conveniently and efficiently and frees up time to spend on more enjoyable past times. You spent precious dollars on your lawn sprinkler system when it was first installed. You made, and are willing to make all the necessary steps to ensure that it will work for a long time. That said, it is very important to perform lawn sprinkler winterization before the cold season comes along. Cold Chicago winters freezes every drop of water that is outside. Even water underground, and inside the pipes of your lawn sprinkler system. As water freezes inside the pipes, it expands and cracks the pipes, rendering the system useless as spring and summer arrive. Aside from the pipes, other equipment such as the backflow device, shut off valves will also be damaged by frozen water. Activating damaged valves can create other problems as well. Do not wait for this to happen to you. American National can help you winterize your lawn sprinkler! Lawn sprinkler winterization is performed by removing all the water out of the system before the freezing temperatures hit. There are three alternative methods for lawn sprinkler winterization; manual drain, automatic drain, and the sprinkler blow out. The water from the irrigation shutoff must be turned off before any of these are done, but like most companies the sprinkler blow out method is the way to go. The blow out method utilizes an air compressor to force air into the pipes and push the water out of the sprinklers. After all the water in the mainline is drained, drain the water in between the shut off valve and backflow device. Then go over all the stations in the system again to make sure there is no water left in any of the pipes. With a large air compressor, it is important to have a pressure regulator hooked up to the unit. This is due to the fact that the air compressor can put out 125 psi pressure. Qualified contractors will only pump 60 psi air into the system. This is roughly equal to normal water pressure. Bad companies will turn on all the valves and blow the very high pressure through the system. They do this to make their visit quick. If a contractor comes to you house for lawn sprinkler winterization and only stays 5-10 minutes then they likely used this method. Using the high-pressure method for lawn sprinkler winterization damages the system and wears out the components. In the springtime, the home owner is left with lawn sprinkler repair bills because the damage done during the lawn sprinkler winterization in Chicago is usually not repaired by the original company that caused the problem. A professional lawn sprinkler winterization company will likely do one zone at a time with 60 psi regulators on the air compressors. This method takes on average of about 20 minutes to perform properly. (847) 566-0099 or fill out our Contact Form.